power of hydrogen; a measure of the activity of hydrogen ions in solution, and therefore, its acidity or alkalinity. 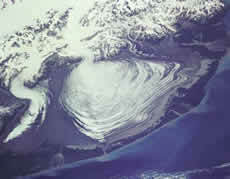 large ice lobe spread out over surrounding terrain, associated with the terminus of a large mountain valley glacier. an Inuvialuktun term for a perennial frost mound consisting of a core of massive ice with soil and vegetation cover; the size can range from a few meters to tens of meters, in both diameter and height; can be found in continuous and discontinuous permafrost zones. massive ice forming the core of a pingo. a pingo remnant in a contemporary non-permafrost environment. permafrost occurring on other planetary bodies (planets, moons, asteroids). 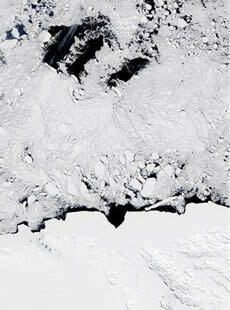 fine-grained soil in which only a portion of the pore water has turned into ice. part of the geologic timescale, corresponding to the time period from 1.81 million to 11,550 years before the present. the absolute value of the ratio between linear strain changes, perpendicular to and in the direction of a given uniaxial stress change. in polar regions, the portion of the year when the sun is continuously in the sky; its length changes from twenty hours at the arctic/antarctic circle (latitude 66 degrees, 34 minutes N or S) to 186 days at the north and south poles. a person working for a long time at one of the polar observing stations; Russian word is polyarnik. a glacier entirely below freezing, except possibly for a thin layer of melt near the surface during summer or near the bed; polar glaciers are found only in polar regions of the globe or at high altitudes. a high-latitude region covered in ice; not a true ice cap, which are less than 50,000 square kilometers (12.4 million acres) and are always over land; more like an ice sheet; also called polar ice sheet. small, shallow depression which forms mainly in winter over some high-latitude seas within a polar or arctic air mass; its motion is approximately the same as the air stream in which it is embedded. in polar regions, the portion of the year when the sun does not rise above the horizon; its length changes from twenty hours at the arctic/antarctic circle (latitude 66 degrees, 34 minutes N or S) to 179 days at the North and South Poles. regions around the North and South Poles, north of the Arctic, or south of the Antarctic Circles, respectively; characterized by polar climate, very cold temperatures, heavy glaciation, and dramatic variations in daylight hours (24 hrs darkness in winter, 24 hrs daylight in summer). in the northern hemisphere, the point in the Arctic Ocean farthest from land; in the southern hemisphere, the point on the Antarctic continent farthest from the Southern Ocean. Russian word for a person working for a long time at one of the polar observing stations. the narrow depression surrounding a high-centre polygon. a pattern consisting of numerous multi-sided, roughly equidimensional figures bounded by more or less straight sides. a peat plateau with ice-wedge polygons. ice-bearing permafrost in which few of the soil particles are held together by ice. ice occurring in the pores of soils and rocks. water occurring in the pores of soils and rocks. Post-glacial rebound (sometimes called continental rebound, isostatic rebound or isostatic adjustment) is the rise of land masses that were depressed by the huge weight of ice sheets during the last ice age. a thin, dry snow surface which is composed of loose, fresh ice crystals. the degree of agreement between independent measurements of a single quantity obtained by applying a specific measurement procedure several times under prescribed conditions. weather at a station at the time of observation.